Providing you the best range of filter pad with effective & timely delivery. Our huge array of superior Filter Pad is manufactured, supplied & exported from the cotton & viscose media, non-woven, and woven filter media for various sizes of sparkler filter press. 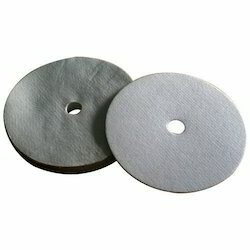 We stand in the midst of predominant filter pads manufacturers, based in India. These filter pads are extensively used in various pesticides, agro chemicals, pharmaceuticals, food & beverage and other industries.